Review by AllTheBestFights.com: 2018-09-22, pretty good fight between Jack Culcay and Rafael Bejaran: it gets three stars. The former Olympian and former Wba light-Mw champion Jack Culcay entered this fight with a pro boxing record of 24-3-0 (12 knockouts) and he is ranked as the No.14 middleweight in the world. He suffered two consecutive defeats in 2017, with Demetrius Andrade (via split decision, Andrade vs Culcay) and Maciej Sulecki (Maciej Sulecki vs Jack Culcay) but he came back to win in 2018 with Craig Cunningham and Adasat Rodriguez (Jack Culcay vs Adasat Rodriguez). His opponent, Rafael Bejaran, has a record of 25-2-1 (11 knockouts) and he entered as the No.48 super welterweight. He suffered his last loss when he faced Ante Bilic in 2012, since then he has collected eleven victories and one draw beating Attila Koro in his last one. 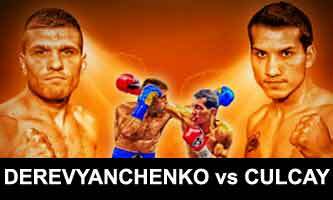 Culcay vs Bejaran is valid for the IBF International middleweight title. Watch the video and rate this fight! Review by AllTheBestFights.com: 2017-10-21, good performance by both boxers: Maciej Sulecki vs Jack Culcay gets three stars. The undefeated Maciej Sulecki entered this fight with a perfect record of 25-0-0 (10 knockouts) and he is ranked as the No.7 super welterweight in the world (currently the #1 in this division is Erislandy Lara). In his last three bouts he has won over Hugo Centeno Jr (=Sulecki vs Centeno Jr), Michi Munoz and Damian Ezequiel Bonelli. His opponent, the former Wba light-Mw champion Jack Culcay, has an official boxing record of 22-2-0 (11 knockouts) and he entered as the No.10 in the same weight class but he comes off the loss against Demetrius Andrade (via split decision, Andrade vs Culcay); before this bout he had beat Jean Carlos Prada (=Culcay vs Prada). Sulecki vs Culcay is on the undercard of Murat Gassiev vs Krzysztof Wlodarczyk. Watch the video and rate this fight! Review by AllTheBestFights.com: 2017-03-11, pretty good fight between Demetrius Andrade and Jack Culcay: it gets three stars. The former Wbo light-Mw champion Demetrius Andrade entered this fight with a perfect record of 23-0-0 (16 knockouts) and he is ranked as the No.5 super welterweight in the world (currently the #1 in this division is Saul ‘Canelo’ Alvarez). He fought just once last year beating Willie Nelson (=Andrade vs Nelson). His opponent, the Wba light-Mw champion Jack Culcay, has a boxing record of 22-1-0 (11 knockouts) and he entered as the No.13 in the same weight class. He suffered his only loss (via split decision) when he faced Guido Nicolas Pitto in 2013 (=Culcay vs Pitto), after this bout he has won seven fights taking revenge on Pitto (=Culcay vs Pitto 2) and defeating Jean Carlos Prada in 2016 (=Culcay vs Prada). 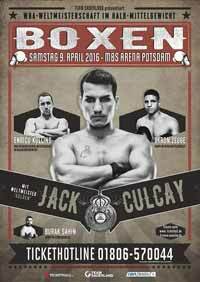 Jack Culcay vs Demetrius Andrade is valid for the WBA World super welterweight title. Watch the video and rate this fight! Review by AllTheBestFights.com: 2015-05-09, good fight between Jack Culcay and Maurice Weber: it gets three stars. Jack Culcay entered this fight with a boxing record of 19-1-0 (10 knockouts) and he is ranked as the No.13 super welterweight in the world. He suffered his only defeat (via split decision) in 2013 when he faced Guido Nicolas Pitto (=Culcay vs Pitto) but after this bout he has won five fights taking revenge on Pitto (=Culcay vs Pitto 2) and beating Karim Merroudj in his last bout (=Culcay vs Merroudj). His opponent, Maurice Weber, has an official record of 21-1-1 (8 knockouts), he lost to Frederic Serre in 2008 but since then he has won nine consecutive fights. Culcay vs Weber is valid for the interim WBA World super welterweight title; undercard of Felix Sturm vs Fedor Chudinov. Watch the video and rate this fight! Review: 2014-12-06, some good exchanges between Jack Culcay and Karim Merroudj but it is not enough to get three stars. Jack Culcay entered this fight with a pro boxing record of 18-1-0 (10 knockouts) and he is ranked as the No.18 light middleweight in the world while his opponent, Karim Merroudj, has a record of 13-3-2 (1 knockout). Culcay suffered his only defeat last year when he faced Guido Pitto for the first time (via split decision, Culcay vs Pitto I) but he took revenge on him in their second bout (=Culcay vs Pitto II); after this fight he has won three times, the last one against Isaac Real (=Culcay vs Real). 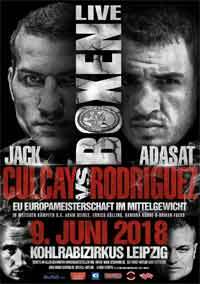 Culcay vs Merroudj is valid for the EBU (European) light middleweight title (Culcay’s first defense); undercard of Juergen Braehmer vs Pawel Glazewski. Watch the video and rate this fight! Review: 2014-08-16, pretty good second part of the fight but it is not enough to get three stars: Jack Culcay vs Isaac Real gets two. Jack Culcay entered this fight with a pro boxing record of 17-1-0 (10 knockouts) and he is ranked as the No.19 light middleweight in the world, he suffered his only defeat last year when he faced Guido Nicolas Pitto (via split decision, Culcay vs Pitto) but in their rematch Culcay took revenge on him (=Culcay vs Pitto 2); after this bout he also beat Dieudonne Belinga and Salim Larbi. His opponent, the undefeated Isaac Real, has a record of 10-0-1 (5 knockouts) and he entered as the No.40 in the same weight class, he has already fought twice in 2014 defeating Rafael Chiruta and Emanuele Della Rosa. Culcay vs Real is valid for the WBA Inter-Continental (held by Culcay) and EBU light middleweight titles (held by Real); undercard of Yoan Pablo Hernandez vs Firat Arslan. Watch the video and rate this fight!